Early varieties are ready from early to midsummer and are further divided into first earlies and second earlies. First early varieties are first to crop, while second earlies follow on a few weeks later. Early potatoes tend to be smaller than maincrop types, but they have arguably the best flavor and often have a smoother, waxier texture that makes them perfect in salads. They’re also sublime when served steaming hot, finished with a drizzle of olive oil and a scattering of herbs. 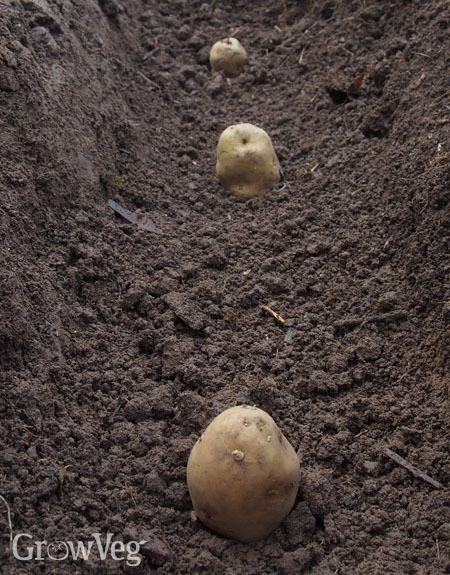 Once they reach six inches (15cm) tall begin hilling up your potatoes. Hilling mounds up the soil along the row to encourage more tubers to grow and to reduce the risk of light exposure, which turns them green. Use a hoe to draw up the surrounding soil around the shoots, leaving the very tops exposed. Hill in stages like this each time the foliage reaches a similar height above soil level, and continue till the mounds are either a foot tall or the foliage above has closed over.